Join us for a Sparkling final Open Saturday before Xmas! EC Design Jewelry, Liz Pechacek Ceramics, Jenny Sheely Jewelry Julia Elise Skin Care, Autumn Higgins Ceramics, Ben Fiess Ceramics and Christine Novotny Textiles! Check out our brand new collection of hand-forged sterling silver collars and neck pieces with interchangeable gemstone bead and metal strands at the new Grand Hand! Thursday Dec. 13th, I will be in the Gallery from 5-7pm. Friday Dec. 14th The Grand Hand is open 10-5pm and their wonderful staff will be there to present my work. Saturday Dec. 15th I will be at the Gallery 12-5pm showing you all the fun ways to wear this new collection! Get your Holiday Shopping done early at EC Design Studio!!! One day only, 30% off all In-Stock, Non-Ring Jewelry, In-Store Only! It’s gonna be just Jewels at this year’s Art Attack!! We will have our regular line all set up as well as our seed bead jewelry line and deep discounts on our “vintage” EC Design wirework jewelry! And our Amazing assistant Jenny Sheely will be showing her jewelry too!! Liz will be in for First Thursday hours 5-9pm, but EC Design is open 12-9pm. EC Design will be closed Saturday July 7th. FREE ROOTBEER FLOATS THANKS TO THE NORTHRUP KING BUILDING!! Stop in and check out what's new at our monthly open studio crawl in the Northrup King Building! Both Liz Pechacek Ceramics and I will be open!! Art-A-Whirl is NE MPLS's Annual Arts District wide open studio crawl! Stop by our Studio #254 in the Northrup King Building for Handmade Jewelry and Ceramics!! 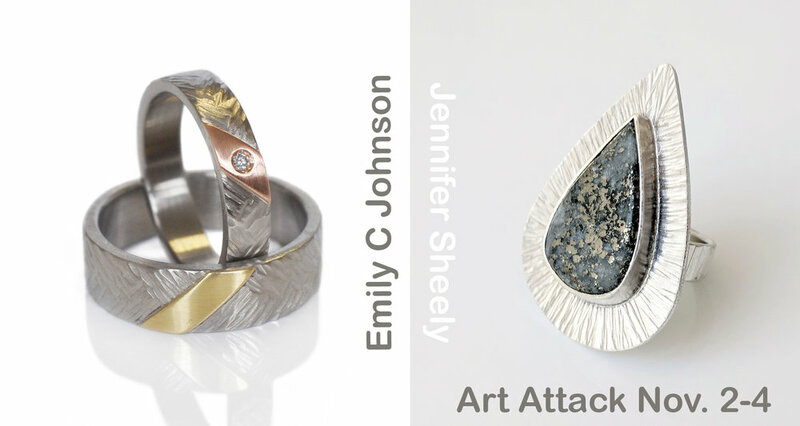 EC Design is excited to host Elizabeth Pechacek Ceramics , Jenny Sheely Jewelry and Darrah Lundberg Ceramics!! We will be hosting our new "forever guest" Liz Pechacek Ceramics!! Pairings! The Northrup King Building artists, studios, and galleries have "paired" up with artists from St. Paul, the Twin Cities Metro, Greater Minnesota, Wisconsin and Beyond! Find your Favorite Artists here and meet the New and Exciting Guest Artists they have invited to share their spaces. Four Floors of Art . Over 30 Open Studios and Galleries under One Great Roof. 6 - 10pm (we have to close at 9pm) on Saturday, March 24. Lots of Free Parking too. It is going to be an Incredible Evening.